Bols Peppermint Green for cocktails and mixed drink. Bols Foam can only be created with the Bols Foam liqueur in combination with its unique pump. Bols Foam can easily be made by inserting the special pump on these 6 Bols liqueur bottles. Just by using the pump, the Bols liqueur transforms immediately into tasty foam which holds for 15 minutes. Bols Foam is a surprising addition to any drink or dessert. The application variety is enormous: Cocktails, Mixed drinks, Shots/ shooters, Sparkling wine, Sodas, Beer, Coffee & Desserts. 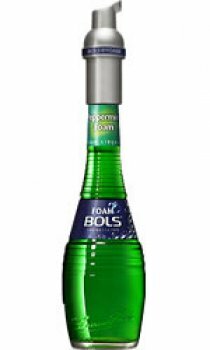 All Bols Foam liqueurs are available in bottles of 200 ml. With 200 ml of each Bols Foam liqueur, bartenders and/or consumers can create 2 litres of foam. It can be used on hot or cold drinks and desserts.